Explore some of the most impressive and best preserved ancient sites in the Mediterranean on the diverse islands of Malta, Gozo and Sicily. See the stunning temples, experience the relaxed island lifestyle and sample delicious food and wine along the way. The trip starts at Malta International airport from where we drive to Cirkewwa and catch the ferry across to the island of Gozo. Gozo is fertile and picturesque and has retained much of its traditional character. Only 15 kms in length and 7 kms wide, all parts of the island are easily accessible, and for its size the variety of scenery is incredible. Please note that there are two transfers arranged for the first day of this trip. The main transfer will be late afternoon with an additional transfer midday to assist with any early flight arrangements you may have in place. We start our exploration in Xlendi, on the south coast, for a short photo stop and walk along the promenade before heading to the island's capital, Victoria; a tiny city named after Queen Victoria in 1887 but locally known as Rabat. After climbing up to the imposing Citadel we'll have a fantastic view of the whole island. We'll explore the old prison where the Knights of Saint John would send their rowdier members to cool off within. The graffitied walls give a fascinating insight into the lives of those who were incarcerated here. Descending to the graceful central square, It Tokk, we have time to wander the cobweb of narrow streets and take some time for lunch. Heading to the town of Xaghra, we reach Ggantija, a megalithic temple complex dating back to 3600 BC and thus named as it was believed only giants could have moved the stones. Some of the colossal stones are over 5 meters long and weigh over 20 tons and the temple still reaches a height of over 7 metres. Predating the Pyramids, this UNESCO World Heritage Site is believed to be the world's oldest free-standing structure. We continue to Calypsos Cave, alleged to be the cave referred to by Homer in The Odyssey. In the afternoon we'll get the chance to stretch our legs on a walk from the area of Calypso's Cave to Ramla Bay where we can enjoy a refreshing dip at the beautiful red sandy beach, if the weather is permits, before heading back to the hotel. Dwejra is perhaps Gozo's most spectacular natural landmark. Here, geology, time and sea have worked together to produce some of the most remarkable scenery on the island. We'll see Fungus Rock, notable as the habitat of a rare fungus which was highly prized by the Knights of Saint John for its medicinal properties. You will then have the option to take a boat ride along the coast from the Inland Sea (weather permitting) - a shallow inland lagoon linked to the sea via a 30-metre tunnel. From Dwejra we continue to the Ta Pinu Basilica, renowned for the miraculous cures reported by it's supplicants. We drive past neat, well-tended fields with their dry-stone walls and enjoy glorious views on our way to Zebbug; perched on a hilltop above the patchwork of green fields below. As with all these fortified hilltop villages, the far reaching views across the island and beyond are spectacular on a clear day. From Zebbug, we'll take a walk to nearby Xwejni Bay. The coastal scenery along the way is varied - at times we pass limestone outcrops eroded by the wind and sea into unusual shapes, where traditional salt pans dominate the view. This section of the coast is one of the most remote and rugged on the island but our walk is relatively steep downhill. There may be a chance to swim (weather permitting) before we visit to the seaside resort of Malfarsorn, our chosen location for lunch. We head back to Mgarr, via Nadur for a brief photo stop of Comino and the Blue Lagoon, to catch the ferry to Malta where we transfer to our hotel in Sliema near the capital. The capital stretches east from Valletta along scenic bays with busy marinas. A seafront promenade skirts around the coast of this busy town and is great for people watching. Our hotel is in Sliema where many restaurants and bars can be found. This morning we plan to drive from the hotel for a walking tour around the impressive and heavily fortified Old City. Originally built by the Knights of the Order of Saint John in the 16th Century, Valletta, UNESCO World Heritage Site, is built on the steep slopes of the Sceberas Peninsula and surrounded by two huge natural harbours which have helped to make it such an important strategic port at the crossroads of the Mediterranean. Fort Saint Elmo guards the entrance to the harbours. Walking down Triq ir Republika - the main thoroughfare in the centre of the city, we visit the elaborately decorated Saint John's Co-Cathedral and the grandiose Grandmaster's Palace with its fine collection of artworks. We'll also admire the classic views across the Grand Harbour from the Upper Barrakka Gardens. Your afternoon is free for your own personal exploration. This morning we head to the historic Three Cities of Senglea, Vittoriosa and Cospicua, considered to be 'the cradle of Maltese history' as settlers and rulers from the Phoenicians to the British all made use of the defences here. The Knights of the Order of Saint John settled in Vittoriosa in 1530 and used the city as their headquarters. The Three Cities have retained much of their romantic medieval charm and we'll see the Inquisitor's Palace in Vittoriosa and admire the views from the Gardjola Gardens - a look-out post to guard the harbour entrance - in Senglea. Driving on to Marsaxlokk, we will take some free time for lunch and exploration. This charming town is Malta's largest fishing port with its colourful boats and excellent fish restaurants. After lunch we will transfer to Sliema for a harbour cruise because the best way to explore the creeks and dockyards is by boat. Only by travelling across the water does one appreciate the sheer magnitude of the ramparts and forts that protect the city. A short drive brings us to Hagar Qim and Mnajdra; another incredible Megalithic temple complex and UNESCO World Heritage Site. For three millennia, from around 3600 - 3200 BC, the Maltese archipelago was home to a unique, temple-building civilisation. The discovery of many fat lady statuettes in the vicinity of Hagar Qim has shown it to have been built to worship the Venus of Malta, the sleeping goddess of fertility. Mnajdra is probably the most atmospheric of all of Malta's temples, occupying an isolated position overlooking the rocky coastline. We walk between the two temple groups along a short well laid path before continuing a short distance along a rough country path to the Tal Hamrija costal 17th century tower to enjoy breathtaking scenery as the cliffs rise out of the blue Meditteranean Sea. We return to our bus where we drive down to the Blue Grotto where we have the option of taking a boat trip (weather permitting) to see a series of natural caverns which glow with brilliant corals and sea sponges. We'll then spend the afternoon sampling a range of local food specialities. We'll learn how sun dried tomatoes and the local wine is produced and then get to sample these along with a selection of other vegatables farmed in the region as well as maltese bread and olive oil. This morning we'll take a short transfer to Malta's Medieval old capital, Mdina, for a tour on foot around this beautifully preserved city. Its warren of winding, narrow alleys (mostly too narrow for cars) and fortified walls contain a number of impressive buildings such as the Palazzo Falzon and cathedral dedicated to the Conversion of Saint Paul. We'll also take time to see Domus Romana (a townhouse usually belonging to Roman dignitaries) and Saint Paul's eerie catacombs (underground). After our visit to Mdina, we'll drive to Mosta Dome and San Anton Botanical Gardens; the private residence of the President of Malta. Depending on the time of our flight we normally have the majority of today free in Malta to explore or relax as we choose. We transfer to the airport this evening for the flight to Catania in Sicily. Our flight arrives late tonight and on arrival we will drive to Syracusa, which takes about an hour. It's therefore best to have an early dinner in Malta before boarding our flight. We will either meet those members of the group just travelling on the Sicily part of this trip tonight or tomorrow morning. During the Greek Classical period, Syracusa was the largest city in the ancient world - even bigger than Athens. Now a UNESCO World Heritage Site, it is also notable as being the birthplace of antiquity's greatest mathematician, Archimedes. Leaving Syracusa this afternoon we drive for a couple of hours inland to Piazza Amerina, a charming market town set amid rolling countryside, which will be our base for the night. This isn't a town on the tourist trail and tonight you have the opportunity to dine in one of the delightful family run restaurants. As you stroll along through the peaceful streets and picturesque squares you can see the local men gathering to discuss the events of the day and to put the world to rights, like they will have done for generations. Later this afternoon, we will drive for a couple of hours north along the spectacular coastline to tonight's hotel in Marsala. Our hotel this evening is about 25 minutes walk from the centre of town. We will go into the centre to the Porta Garibaldi from where our Explore Leader will take us on a short walk through the old town and there is the option to have a wine tasting to try the well-known Marsala dessert wine, which originates from here. After time for dinner we'll return to our hotel. On leaving magnificent Segesta, we drive for around an hour along the north coast to our hotel in Sicily's capital, Palermo where we have the evening free. If you fancy a snack whilst exploring then you could try panelle, which is a popular street food. It's a fritter made from chickpeas eaten in a roll like a hot sandwich. If you fancy something sweet then cassata is Sicily's most famous cake, which is normally covered in marzipan and green icing over a moist fruity sponge layered with ricotta. Please note, on our 12 May, 15 September and 6 October 2018 departures we will be staying in Taormina instead of Giardini Naxos on days 6 and 7. The towns are only a short distance apart along the coast. The itinerary inclusions will remain the same and you'll still have the opportunity to visit Mount Etna, the only difference is that you won't be visiting Giardini Naxos and your free time on day 7 will be spent in Taormina instead. If you still want to visit Giardini Naxos then it's easily accessible on the hop-on public bus from Taormina. You might choose to visit the Villa Comunale Gardens which offer a peaceful escape from Taormina's bustling main street. Here you can walk amidst magnolia, hibiscus and bougainvillea trees. If you'd like to enjoy a drink and a snack then we'd recommend taking a stroll down one of Taormina's side streets where you'll find a variety of less-busy bars and restaurants than in the very centre of town. April/May and October/November are pleasantly warm. Juneeptember are the hottest months. A selection of optional activities are listed below to help you budget for your holiday. Whilst the trip price you pay before you travel includes a great selection of highlights, we have also built in free time to allow you the flexibility to choose from a carefully selected range of additional excursions or to take time to relax, the choice is yours. At certain destinations along the way there may be several options to choose from and it may not be possible to fit all the activities in; your Explore Leader will be able to give advice on which are the most suitable for you. Throughout most of the year it's best to dress for hot conditions, although light rainwear and a warm fleece/jacket for nights when temperatures can drop is recommended. If you're travelling in March, October or November then the weather can be cooler and rain more frequent, so it's best to pack layers and rainwear just in case. Anyone intending to visit Mount Etna should bring warm clothing as snow is a common occurrence (even in June). Wind and waterproof garments are therefore suggested for those wishing to visit the volcano. Women should avoid bare arms and shoulders in churches, so it's best to carry a scarf or shawl. It's best to pack comfortable walking shoes for exploring and sandals for relaxing and going to the beach to swim. You will want warmer shoes and socks if you're going to go up Mount Etna. Sicily is located off the southern coast of Italy and Malta is between Sicily and the North African coast, and therefore the weather on both islands tends to be sunny, so a sunhat and sunscreen are essential. You should also bring a two litre water bottle, torch in case of emergencies, and insect repellent. You may also wish to bring a swimming costume and towel in order to make the most of swimming opportunities off the coastline. At any time of year it can be snowy on top of Mount Etna and considerably colder, so if you plan to travel up the volcano we'd recommend bringing gloves and a woolly hat. Although entirely voluntary, tipping is a recognised part of life in this region of the world. Some local staff will look to members of the group for personal recognition of particular services provided. Accordingly, you should allow £40.00. Since there is relatively little opportunity to change money on this trip, it is advisable to arrive with a supply of Euros to avoid inconvenience. 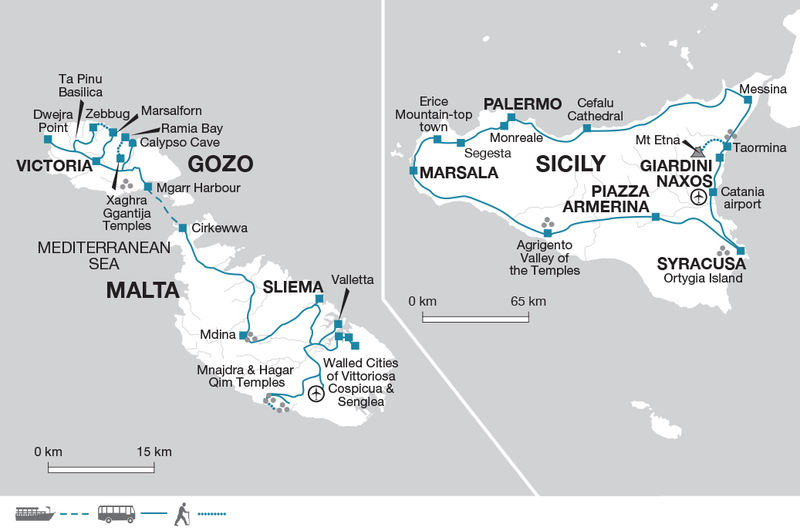 Money can be exchanged in the hotels in Gozo and Malta, Catania Airport, Agrigento, Palermo and Taormina in Sicily. Are not recommended due to the high rate of commission and limited opening times of banks. Changing them can be very time consuming. In Sliema the hotel we use is in a great location on the main promenade and just across the road from the nearest public beach. The hotel has two swimming pools, a restaurant, pizzeria, two bars and a cafe. The bedrooms have simple decor and they vary in size and layout. All are equipped with air conditioning, TV, telephone, hairdryer, safe (additional charge payable locally) and have an en suite bathroom. Some rooms also have a balcony and the view from the rooms varies - some are internal facing or have a street or partial or full sea view. Rooms are allocated on a run of house basis. The hotel does have single rooms, which are smaller than the twin rooms and may be allocated to you if you book our Single Room Option. Italy and Malta: Visas are not required by UK, E.U Nationals, Australian, New Zealand, US and Canadian citizens. Other nationalities should consult their local embassy or consular office. All visa information is subject to change. You should confirm all visa related questions with the relevant embassy prior to departure. On this two week trip to Malta, Gozo and Sicily experience the highlights and contrasts between all three of these stunning Mediterranean islands. Visit a variety of sites from different historic eras, often accompanied by a local guide in order to get the most out of each visit. See the coastal and mountain scenery including Mount Etna and have the opportunity to swim in the sea.